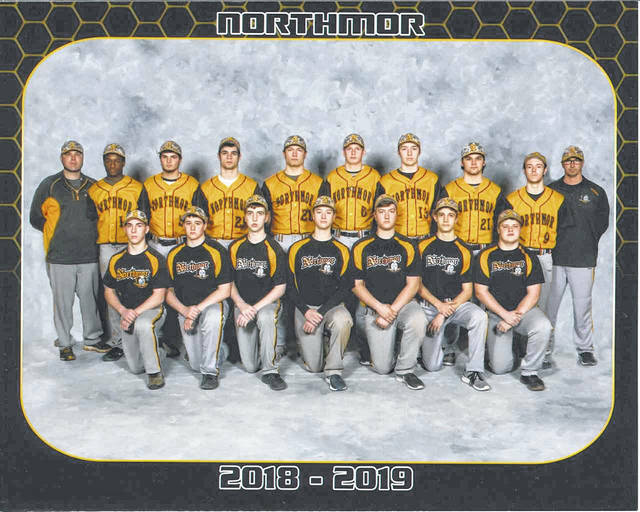 Photo courtesy of Gary Bellew, Unique Images The 2019 Northmor Golden Knights varsity baseball team will look to improve on their 11-11 overall finish from a season ago and will once again be led onto the field by veteran head coach Buck Workman. GALION — Baseball officially returns to Northmor on Saturday, March 23 with a trip to Crestline for a non-conference doubleheader against the hosting Bulldogs. Northmor is under the familiar leadership of head coach Buck Workman. Workman has 18 years under his belt as skipper, all with the Golden Knights, and owns a career coaching record of 205-242. He will be joined in 2019 by assistant coaches Mark Wiseman and Courtney Church. In 2018, the Knights finished their season at 11-11, which included a 5-8 mark within the Knox-Morrow Athletic Conference. In the conference’s inaugural baseball season, the Fredericktown Freddies captured the league crown, finishing at 17-8 overall and 12-2 in the KMAC. Workman will field a team consisting of eight returning letterwinners and seven players new to the varsity. Seniors Mostyn Evans and Ryland Thomas will lead the way, following their junior seasons that awarded them their third varsity letters on the diamond. Senior Chris Bood and juniors Hunter Mariotti and Wyatt Reeder are back for Workman for their third season of varsity baseball. Also returning to the field for Northmor are one-year letterwinners: sophomore Pierce Lower and juniors Brayden Black and Conor Becker. Becker is late to the action following a Division III state wrestling title in the 170-pound weight class. In addition, five juniors and a pair of seniors are looking to make an impact. JuniorsTyler Brown, Eli Davis, Bryce Downard, Zach Harriger and Alex Tuttle will suit up for the first time for the varsity squad. They will be joined by seniors Kalob Barney and Dakota Downard. “We have plenty of varsity experience returning and some depth in our freshman and sophomore group that could make a push for varsity time. We will have to continue to work on our defense and remain consistent if we wish to be competitive” states the head coach on his team’s strength and concerns headed into the season. KMAC play will begin early on in the season as, following their scheduled doubleheader Saturday, the Knights will make the bus trip to Fredericktown to battle with the reigning champion Freddies on Monday, March 25.
https://www.galioninquirer.com/wp-content/uploads/sites/38/2019/03/web1_Varsity-Baseball.jpgPhoto courtesy of Gary Bellew, Unique Images The 2019 Northmor Golden Knights varsity baseball team will look to improve on their 11-11 overall finish from a season ago and will once again be led onto the field by veteran head coach Buck Workman.